NEW NEWS: The Kindle version of the book is now available at Amazon.com ($9.99). I’m sure we all know the feeling of what happens when we fail to communicate properly… not unlike a bunch of huge dinosaurs or bulls in a china shop. No doubt you had that experience using our wonderful email technology… an accident waiting to happen on each press of the SEND button! If I were to give any lessons on improving communication in viewing the ‘drama’ that is created by the use of technology, it surely would have to be the use of email to communicate about sensitive matters in lieu of picking up the phone. You don’t have to be a psychologist to know that most times it’s simply a lack of courage to confront the issues in a 2-way manner. It’s so easy (and habit forming) to haul off a strong message that you would probably never say on the phone and surely in person. And if you would, it probably would be posed in a much softer manner. Being known as a rather ‘direct’ conversationalist, you can take the above from me as a confession – and they tell me ‘confession is good for the soul and may get me redemption. I suspect I’ll be waiting a long time for such at the rate I’m going. So learn from my experiences as an observer of other sinners… and myself! 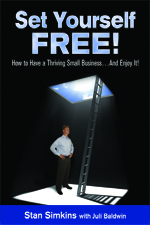 Your mindset about this subject could make a huge difference in unlocking the full potential of your business as I say in my book, Set Yourself Free – How to Have A Thriving Small Business… And Enjoy It. You are currently browsing the archives for the Manpower category.